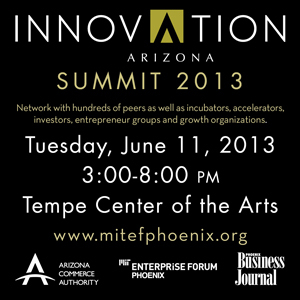 Meet Arizona Capital and Business Growth Resources on June 11, 2013 at the MIT Enterprise Forum and Arizona Commerce Authority Innovation Arizona Summit. Full details and registration available at www.mitefphoenix.org. There are many organizations in Arizona that support innovators, startups, entrepreneurs and the established business community from early stage to exit. This is an easy to use reference of various groups, associations and service providers in Arizona that help businesses with financing, strategy, venture development, M&A, growth and mentoring services and business networking. The Discovery Triangle Innovation Concentration Map of Phoenix-area accelerators, incubators and work spaces. If you know of an organization that fits into the categories above, you can add the reference in a comment or email jamieglass8@gmail.com. This list is maintained by Jamie Glass, President of Artful Thinkers.